Visit GlowHost Internet Solutions online at GlowHost.com for all your web hosting needs. GlowHost specializes in extremely reliable and affordable web hosting plans for individuals, businesses, and Mission-Critical Enterprise Hosting operations. GlowHost has been in business since 2002 hosting tens of thousands of websites. Save on your next purchase from GlowHost.com with GlowHost Internet Solutions discounts, GlowHost Internet Solutions coupons, GlowHost Internet Solutions promotions and GlowHost Internet Solutions savings from 58coupons.com. hurry on over to GlowHost.com where you'll receive $125 for signing up a friend. GlowHost Internet Solutions is offering Professional Shared Web Hosting Starting @ $6.99/month. Click link to get started. 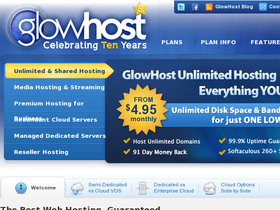 GlowHost.com offers reseller web hosting for the low price of $24.95 per month. Click link for details. Unlimited Domain Shared Web Hosting Plans Starting @ $4.99/month from GlowHost Internet Solutions. Click link to get started.